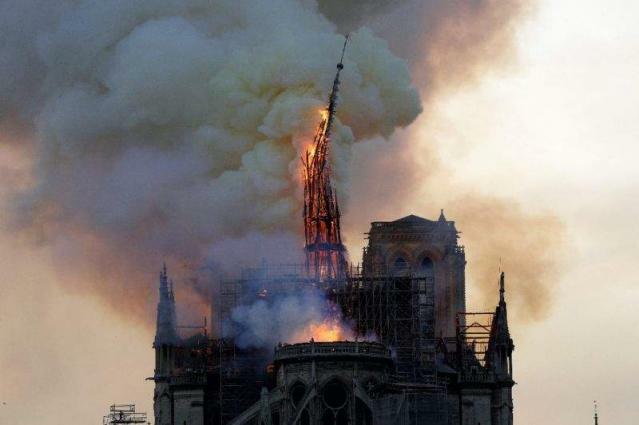 Paris, (UrduPoint / Pakistan Point News - APP - 16th Apr, 2019 ) :French investigators probing the devastating blaze at Notre-Dame Cathedral questioned workers who were renovating the monument on Tuesday as hundreds of millions of Euros were pledged to restore the historic masterpiece. - 'Epicentre of our life' - French President Emmanuel Macron struck a defiant tone on Monday night as he visited the scene with his wife Brigitte, telling reporters: "We will rebuild Notre-Dame because it is what the French expect." He described the cathedral as the "epicentre of our life". The privately run French Heritage Foundation launched a call for donations on its website -- www.fondation-patrimoine.org -- and several pages were also set up on the Leetchi fundraising portal. - Full losses unknown - Thousands of Parisians and tourists watched in horror from nearby streets on Monday as flames engulfed the building and rescuers tried to save as much as they could of the cathedral's treasures built up over centuries. In a rare statement, Britain's Queen Elizabeth II said she was "deeply saddened", while Pope Francis sent his hopes that Notre-Dame "may once again become, thanks to reconstruction work and the mobilisation of all, a jewel in the heart of the city. "The cathedral has figured as a central character through the ups and downs of French history since construction began in mid-12th century -- and has featured in countless books and movies.